December 16, 2013—The bamboo bicycle caught my attention when reporting on the Green Climate Fund Conference in Warsaw last month where the U.N. chief, Ban Ki-Moon, was seen riding around the city, and the conference hallways, on a bamboo bike. At the conference, the Bamboo Bike Initiative of Ghana was one of several projects being recognized by the U.N. as a Lighthouse Activity, a project which shines light towards the future, helping to build a low carbon and efficient world, “tackling climate change, health, financial and social problems.” They are recognized for the beacon of hope they shine on their communities and throughout the world. The Bamboo Bike Initiative provides an affordable form of transportation plus provides jobs for those in rural African communities. I am more than satisfied with my bamboo bicycle. I have ridden on rough, stony roads and it has shown no signs of wear and tear. I strongly recommend these bikes to my friends. The appearance of them is better than steel machines. There still seems to be a prejudice against them, but as my experience goes, it is an unfounded one. I believe they are as strong as any on the market. This same review might have been written in 2013. They are highly recommended by those who ride them and stand up to any bike on the market, yet, they are not as widely accepted as carbon fiber or steel framed bikes. 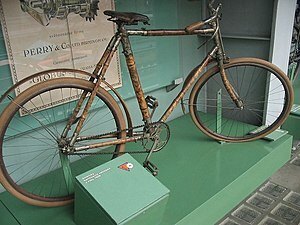 Bamboo bikes today are made as road bikes, mountain bikes and racing bikes. The methods used to make the bamboo durable consists of smoking, heat treatment, torching or placing the bamboo in ovens. The poles can be joined using metal, resin saturated fibers or hemp and coated with a substance to prevent water damage. The Bamboo Bike Initiative was established in 2009 in Ghana to reduce rural unemployment by training apprentices to assemble the bamboo bike frames. The long term goal is for these apprentices to open workshops in their villages and train 5 or 6 more people to craft the bikes. The bamboo for the bikes is grown locally, which keeps the bikes at a lower cost, provides jobs for the unemployed in Africa and creates a healthy atmosphere, as it is a prolific producer of oxygen. Categories: Energy Programs | Tags: Africa, Bamboo, Bamboo bicycle, Ban Ki Moon, Bikes, Ghana, Warsaw | Permalink. Thank you for your comment. When I educate myself through researching these topics, I hope to educate others. Thanks again. Appreciation to my father who informed me on the topic of this blog, this blog is actually remarkable.